Petite, faceted aquamarine teardrops are strung together to create a luxe fringe on the front of this bar style necklace. 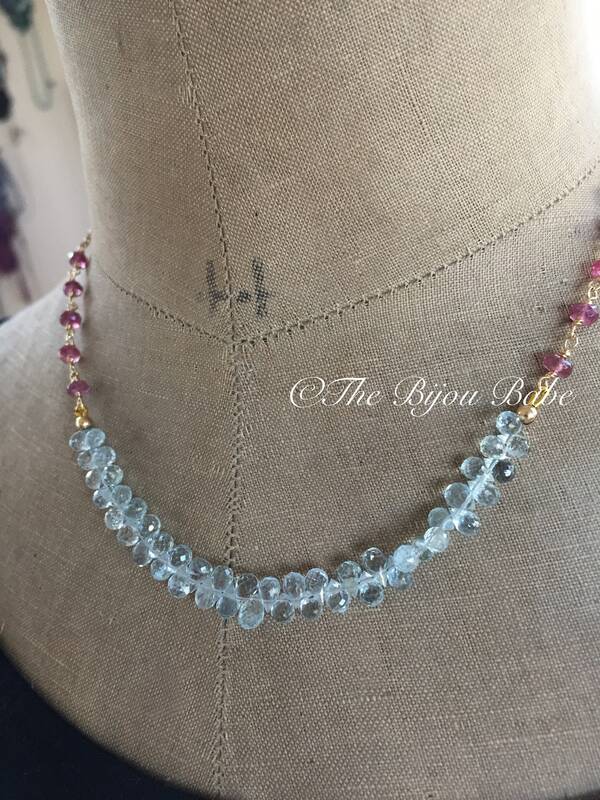 The watery blue hues are accented by bright pops of pink tourmaline rondelles, which are wire wrapped on the sides and attached to the gold filled cable chain. A beautiful necklace for any aquamarine lover or March birthdays, it looks perfect on it's own or could be layered with other pieces for a funky, boho luxe look. Your aquamarine fringe necklace will ship USPS Priority Mail with tracking in the US, and will be packaged in a signature The Bijou Babe box for gifting or safe-keeping.